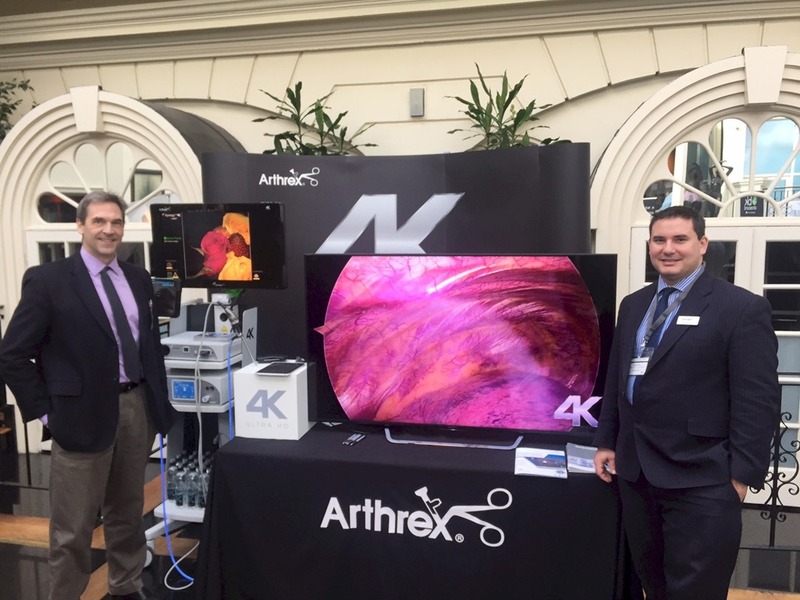 Forclarity CEO Bruce Lynn attended the Minimally Invasive Surgery Congress in London this week. The event featured an extensive and authoritative line up of over 40 speakers covering the specialities of Urology, Colorectal (the track Bruce attended), and Hip & Knee. They also had an exhibition area showcasing about a dozen companies. The most intriguing, from a Forclarity perspective, was Arthrex who has brought a 4K laparoscopic system to market with some striking image resolution and capabilities (see photo above with Arthrex manager Andrew Bell on right). Shafi Ahmed, Director and Head of Programme Virtual Medics gave a talk titled “The Virtual Surgeon” which expanded on the “revolution” in surgery theme asserting that the “Fourth Industrial Revolution…blurred lines between industrial, biological and digital technologies.” He cited innovations such as Snapchat (“the biggest AR platform in the world”) that could be used to share surgeries online so students around the world could watch them and learn from them. He noted the importance of such pervasively used consumer technologies shaping the mind sets of the new generation of clinicians. Nigel Hall, Lead Clinician, Consultant Colorectal Surgeon, Addenbrooke’s Hospital NHS Trust gave a talk titled “Transanal Endoscopic Microsurgery (TEMS) Excision of Large Rectal Polyps” where he examined the dynamic tension of cutting “too much or too little” in polyp excision. One of Forclarity’s applications are tools to provide visual aids to alert to missed areas of abnormal tissue. This application directly targets the “too little” side of the problem, but also would ideally help the “too much” side as well if clinicians feel they can reduce the “too much” (healthy) tissue excised for safety sake. The event provided many opportunities to meet many of the participants and the speakers. The audience was dominated by clinicians and practitioners. Many seemed impressed that Forclarity was joining in the sessions to get a first-hand look at the problems and challenges surgeons face on a daily basis. As a member of the discussion panel noted about the surge of innovation, “People are coming with solutions looking for problems for it to solve.” Forclarity has been starting with a big investment in examining and understanding the problems first.